Many years ago, the Wilhern family's maid got pregnant from the son of her master, but he is not allowed to marry her because she would not be "one of their kind". The woman commits suicide and her witch mother curses the daughters of the family that would have the face of a pig until one of them finds true love with one who will love her faithfully. Penelope Wilhern is the first legitimate girl after generations and born with nose of pig. 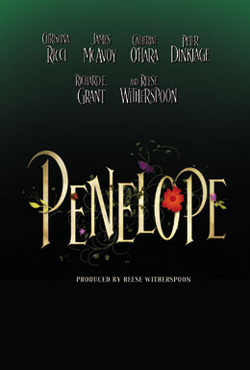 Her mother Jessica hides her from the world in the Wilhern mansion, and Penelope is raised alone, with no friends. When she becomes a young woman, her parents try to find a wealthy bachelor to marry her and break the curse. Meanwhile the tabloid reporter Lemon and the aristocrat Edward Humphrey Vanderman III that have issues against the Wilhern family hire the gambler Max to meet Penelope and take a picture of her. But their scheme does not work as planned.